In which area of ​​Alanya is better to buy an apartment? Home › Blog › In which area of ​​Alanya is better to buy an apartment? When planning to buy property in Turkey, it is important to pay attention not only to the condition of the apartment, the location of the complex. Necessary to choose the area. And when choosing to take into account various factors that primarily will affect the quality of life and rest. First of all, it is necessary to indicate the purpose of buying property in Turkey. To decide on the desire: to live by the sea, to come to rest or rent an apartment. Of course, in all three cases it is important that all amenities of the infrastructure, such as: supermarkets, banks, pharmacies, hospitals, be near the complex. The benefit now is all in every Alanian district. But some features still worth considering. For example, a new state-owned hospital equipped with the latest technology is located in Oba. In the center there are also many good large private clinics. But from such areas as Avsallar or Mahmutlar for the help of narrow specialists will have to go to the center. If you are planning to buy an apartment for the whole family, then it is important to consider the presence of schools and kindergartens. The best educational institutions are again located in Oba and the central region of Alanya. Kestel also has a Russian school. There are two universities in the city, Başkent Universitesi is located in Oba, and Alaaddin Keykubat Üniversitesi is located in Kestel. Those who choose property in Turkey for recreation, first of all pay attention to the beaches. The sands are located in the center (Cleopatra beach and Damlatas), in Avsallar (Incekum) in Oba and Tosmur. In Kestel and Mahmutlar beaches are mostly pebble, in some places there are large stones at the entrance to the sea. But not least, all the beaches in Alanya are equipped with deck chairs, umbrellas, changing rooms and cafes. It is worth considering the distance to the beaches from the main complexes where foreigners buy real estate. So most of all real estate on the first line is for sale in Mahmutlar, there are apartments near the sea in Oba and in Kestel. In the center, residential buildings are located a little further, but there are also prestigious complexes with hotel infrastructure, located on the first coastal. If you live and relax by the sea or a little further - the question is not fundamental, then you can safely choose Tosmur or Cikcilli. They are located behind a bypass road, but at the same time from modern residential complexes to the beaches can be easily reached on foot. In Avsallar, residential complexes are also located at some distance from the sea shore, since the first line here is occupied by hotels. As in all cities in Alanya, there are both rave and calm areas. And of course, the busiest in the city is the center. Here most of all night clubs, restaurants, bars. 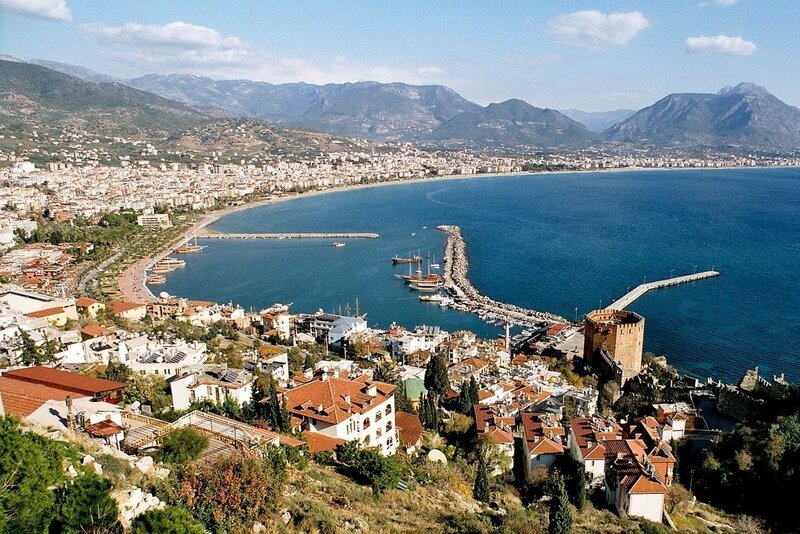 And in general, in summer, the center of Alanya is an area that does not sleep until morning. Because it is here that tourists and locals come who love to get together and have a good walk. In addition, if you choose the center of Alanya, be prepared for the fact that in the summer there will be a lot of people in the afternoon. After all, this is where the Alanya Castle and the famous Damlatas Cave are located, as well as a huge number of shops for excellent shopping. Quieter in this respect Both. But here, on the main street, there are a lot of bars and restaurants, although there is no music in Both until the morning, but you should take into account that the main street is filled with tourists every season. But a couple of blocks inland from the pedestrian street - and here it is the area for a quiet life and comfortable rest. Mahmutlar can already be called the Russian region. So here, both in winter and in summer, the most are “ours”, therefore the language barrier is not felt here, and in the summer season life boils. The most peaceful areas are Tosmur and Cikcilli. In the latter there are no hotels at all, so it is quiet and comfortable even in high season. But at the same time to the center at hand. As for Avsallar, since there are many hotels here, in summer the area is filled with tourists, cafes and restaurants are opening. But in winter, Avsallar becomes empty, because there are only local residents who are not so many here. If you plan to buy property for rent and passive earnings, then you should consider in which areas apartments are most in demand. The most popular among tourists are Oba and Alanya Center. Because the beaches are good, and entertainment infrastructure is at hand. But we should also take into account the fact that rental prices are far from cheap, however, the property itself is somewhat more expensive than in the same Mahmutlar. But, first of all, apartments in these areas are filled with tenants in the summer. Avsallar is also very popular with holidaymakers, since it is here that the complexes with the most extensive hotel infrastructure and a large territory are located. Not far behind the demand and Mahmutlar. Because this area is very popular among Russian-speaking tourists. Apartments in Tosmur also actively rented. But Cikcilli is in demand a little less, however, like Konakli and Kargicak. Of course, in addition to the points we have described, there are also many other subtleties that should be taken into account when choosing an area when buying an apartment in Turkey. But all this needs to be considered individually, and better - with a direct visit to Turkey. And the company maxhomeinvest will be for you the best assistant.